Pete Thomas is considered the most successful contestant to come away from NBC’s The Biggest Loser, ultimately losing 185 pounds and keeping it all off for more than seven years. He’s also one of the most awesome, too, as we really, really enjoyed him on season two of the show. (Pete’s the man!) 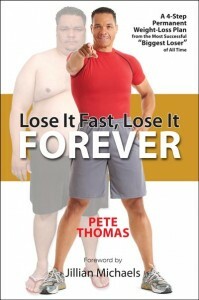 And besides staying trim and healthy over the years and speaking and inspiring others to get healthy, Pete now has a new book out: Lose It Fast, Lose It Forever. And we read it! We’ve reviewed a lot of diet and weight-loss books in our day, and this book is the real deal. It isn’t gimmicky or a magic bullet. It’s an extensive plan that you can follow to figure out the reasons why you’ve gained the weight, get it off and stay healthy for the long-term. Sprinkled with behind-the-scenes peeks at his time on The Biggest Loser and his top lessons learned, Pete shares his four-part weight-loss plan. And, honestly, it’s no quick read. Through finding “Your Power,” “Your Plan,” “Your Pursuit” and “Your Purpose,” it’s a somewhat dense and cumbersome book that requires you to really do the work to figure out what’s holding you back. I do like books like this, books that aren’t diet plans but require more work on my part to get to the heart of the issue. Right now I’m reading Women Food God and If I’m So Smart, Why Am I Still Fat, and getting a lot from them. The two books work well in tandem, as they both reinforce the other. I’m reading them slowly and making time to process and apply what I read. Thanks for posting this – I always like recommendations and information about good-quality healthy lifestyle books! I loved Pete, so I bet this is a good one. I, also, like books that deal more with the emoitional side of things. I have enought knowledge about diet and exercise to be a trainer or a nutritionist, but it’s always the emotional side of things that gets me. I’m on my way now (47 pounds down and about 40 more to go! ), and a huge part for me is struggling with my own thoughts and self-esteem issues.